Why I am proud to be A Reform Jew – Walking Humbly. Seeking Justice. Living with Hope. I am proud to be a Reform Jew for so many reason our embrace of women spiritual leadership, our amazing youth programs inspiring faith and tradition in our young people, our contemporary music and innovations in worship. But what has always inspired me spiritually, theologically has been our emphasis on ethics and social justice. Today our Movement responded to the deplorable rollback in civil rights perpetrated by the Trump Administration. I am proud to be a signatory and co-author of this statement on behalf our Reform Movement, over a million Jews strong in North America alone! WASHINGTON—The Union for Reform Judaism, the Central Conference of American Rabbis, and the Religious Action Center of Reform Judaism condemn President Trump’s decision, and resulting actions by the Offices of Civil Rights of the Justice and Education Departments, to overturn a federal rule making the nation’s public schools welcoming and safe for transgender students. The book of Genesis teaches us that all human beings are created in the Divine image — a status certainly shared by transgender men, women, and children, males created in female bodies and females created in male bodies. The rejection of Title IX protections for transgender students undermines the safety and security of all students. Further we are concerned that if the government can set aside Title IX for some students, important Title IX protections for all students and in particular women and minorities are also at risk. Tragically, transgender youth are especially vulnerable — to bullying, to rejection by their families and by their peers, to violence, and to suicide. A government that deprives youth of their right to safe schools, and specifically to use the restroom that conforms to their gender identity — in short, a government that fails to protect their imperative to live in accordance with their gender identity — is a government that is willing to accept bigotry and bullying. Far from protecting girls and women from men in women’s bathrooms, decisions such as this imperil transgender youth. Transgender men and boys may appear threatening and come under attack if forced to use women’s restrooms. Transgender women and girls risk becoming victims of violence if forced to use men’s restrooms. The Administration has overturned a rule that was sound public policy and endeavored to uphold pikuach nefesh, saving life, the very highest of religious injunctions. This matter is personal for Reform Jews. Our congregations proudly embrace transgender men, women, and youth among our members. Some of our rabbis are transgender. Many children in our congregations and communities, including children of our rabbis, are transgender. Our rabbinical seminary, Hebrew Union College-Jewish Institute of Religion, educates transgender Jews for sacred leadership roles in our community. Our congregations, our youth programs, and our summer camps fully accommodate transgender youths and adults in accordance with their gender identity. We lament this serious step backwards in the effort to protect transgender youth — and, more broadly, in the march toward equal civil rights for all Americans. 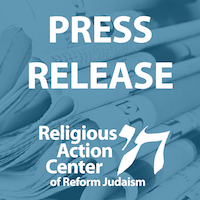 The Religious Action Center of Reform Judaism is the Washington office of the Union for Reform Judaism, whose nearly 900 congregations across North America encompass 1.5 million Reform Jews, and the Central Conference of American Rabbis, whose membership includes more than 2,000 Reform rabbis. Visit www.rac.org for more. I am grateful for your leadership, and for the countless hours you have devoted to the movement as president of the CCAR. Thank you so much.